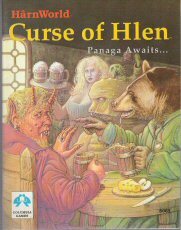 Harn is a fantasy campaign setting, first & foremost. It is based roughly on medieval Europe, with seven countries: Five feudal, one democracy and one nordic-style. The emphasis is on realism, with magic & fantastic elements muted. 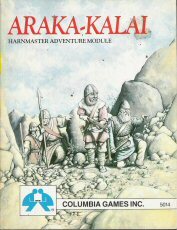 Actually a continent, Harn was one of the most detailed settings in print in the early 80s. Different culture/region books got color ads in the Dragon Magazines of the time. In terms of richness and detail, the setting was way ahead of its time, and still an attractive setting today. 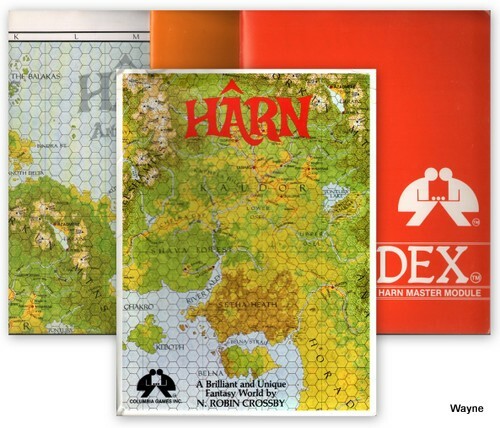 The original Harn folder contains Harnview (32-pg; overview & GM info); Harndex (64-pg; 1000 entries on history, geography, religions, cultures, politics, and economics of Harn); Regional Map (a beautiful 22"x34" poster map). "REGIONAL MAP: A beautiful color map (22" x 34" ) of Harn, covering an area approximately 600 x 900 miles This is a useful and detailed technical map, with a 1 cm hex grid, and a location grid for easy reference. 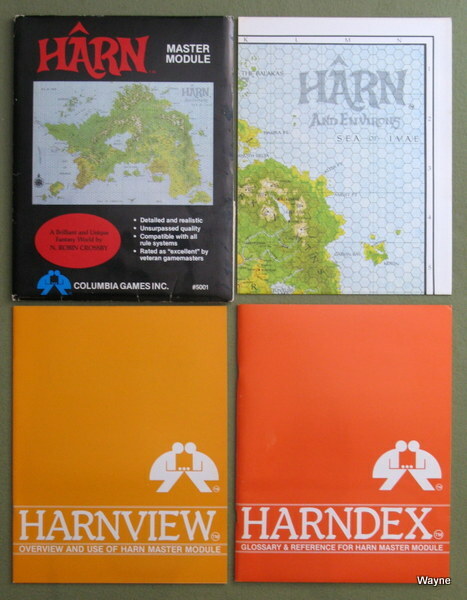 OVERVIEW ("HARNVIEW"): A 32 page booklet describing Harn, and gamemaster information, including: birthing characters, pregame hints, weather generation, encounter tables, and much more. 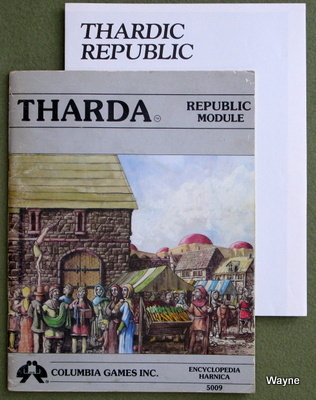 INDEX ("HARNDEX"): A 64 page booklet describing almost 1,000 entries on the geography, religions, cultures, politics, and economics of Harn, including: mountains, rivers, (owns, castles, kingdoms, dwarves, dragons, gods, temples, prices, incomes, etc. The index also contains numerous illustrations all compiled into one alphabetical reference, making information access quick and easy." 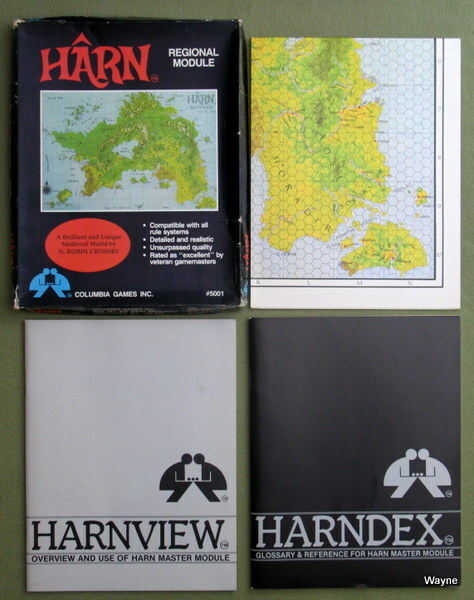 Harnview (32 pages), Harndex (64 pages), Regional map. "Harn is a rugged, forested, hazy, island off the northwest coast of Lythia. Harn is regarded with disdain by most Lythians. Tales of wild men, dwarves, elves, and fearsome beasts have been carried to the continent and these have served to discourage all but the most adventurous of travellers. Included is a beautiful full-color map of Harn (20" x 30") and an overview and detailed index of the cultures, economics, geography, history, politics, and religions of the island." 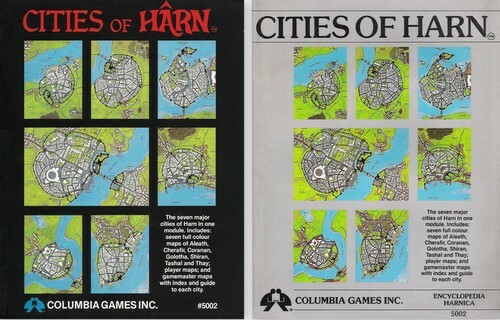 "CONTENTS: All seven articles in Cities of Harn include a colour city map, interior plans of various buildings, including temples, taverns, and arenas, and an extensive key to buildings and special features in each settlement. The Cities of Harn can be used as independent towns that can be dropped into any existing fantasy world. ALEATH: A freetown in Kanday, Aleath is considered one of the most beautiful and peaceful cities on Harn. Although its history has sometimes been marred by bloodshed it has always survived, and is considered one of the safest places on Harn. CHERAFIR: The ancient capital of Melderyn that may trace its origins to the enigmatic Earthmasters. Commonly called the "Mages' City", most outsiders consider it a place of bizarre happenings and weird inhabitants. CORANAN: The largest city on Harn and the capital of the Thardic Republic. Coranan is known for its profusion of palaces and great buildings, relics of the fallen Corani Empire. GOLOTHA: An urban blight, and the primary settlement in Rethem Golotha squats at the mouth of the Thard River. A city of secrets and dark places governed by a malevolent religious council, Golotha has a well deserved reputation for corruption and sudden death. SHIRAN: The second city of the Thardic Republic, Shiran is a mecca for hedonists and is widely known as the "City of Sins". TASHAL: The principal seat of the kings of Kaldor, Tashal is the second largest city on Harn. Founded six hundred years ago on the ruins of an older city, Tashal has a labyrinthine network of underground tunnels beneath its streets. THAY: Founded less than two centuries ago by fugitives from Aleath, Thay is a freetown in Melderyn. In the last fifteen years it has withstood two raids from Ivinian pirates." "Gods of Harn, the Libram of the Pantheon, bridges the physical and spiritual world of Harn. Gods of Harn is part of a series of expansion modules for the fantasy world Kethira. It provides detailed and consistent information about the beliefs, religious rituals and internal organizations of the churches of the ten gods. Gods of Harn is compatible with any rule system you may now use. It allows you to use religion and worship as integral parts of a realistic fantasy campaign, rather than mere notions of "good or evil". Gods of Harn is beautifully illustrated and includes color plates of clerical badges, heraldry of the fighting orders, formal clerical robes and a Religious Calendar, showing all the significant religious dates. Gods of Harn is sure to become the standard by which fantasy religious systems will be judged." There are 4 full-page color maps, each with a black & white player's map on the reverse side. AZADMERE: The mountain kingdom and dtp of the Khuzdul. A colour map of the impressive walled city, plans of the city's tunnel network, and a colour atlas map of the kingdom are included. 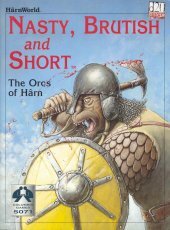 KHUZDUL: The history, culture, religion, and economics of Harn's dwarves. HABE: The human keep and barony within the Kingdom of Azadmere. This article contains a colour site map and interior plans of the keep, plus interior plans of a ghost haunted inn. ZERHUN: The mighty Khuzan stronghold guarding the southern border of the Kingdom of Azadmere. A colour site map, and plans of the fortress interior, tunnels, and the impressive Zerhum barbican are included. NOTE: All of the above material was formerly published in Encyclopedia Harnica numbers (1) and (16). No new material has been added." SINDARIN: The history, biology, and culture of the immortal elves of Harn. ULFSHAFEN: The trade center and port of the elven kingdom. A colour site map, interior plans of an inn and seamans' hostel, and details on local customs, the small human population, arid economics are included. 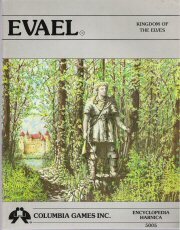 ELSHAVEL: The hidden capital of Evael. This article contains a colour site map and interior plans of a typical Sindarin clanhouse, plus information on eluen government, religion, etc. PESINO: The ancient Earthmaster site and Sindarin-Khuzdul trading center for several millenia during the Codominium. Includes a colour site map, plus extensive interior plans of three buildings and various legends regarding the site. EVAEL: A full colour map of the kingdom, showing Sindarin clan-houses and other features. Details on the enchanted Shava Forest and the "lost city" of Alarienel." KALDOR: The Kingdom of Kaldor is on the verge of a succession crisis. The aging king has no legitimate heir, and contenders for the throne are jockeying for position. A large colour map of the kingdom is included, with political, historical, economic, and cultural notes, and a colour plate of the heraldry of the Kaldoric great clans. OLOKAND: A formidable royal castle, Olokand controls the Fur Road to Orbaal. The site of a prestigious Royal Tournament of Chivalry. KIBAN: An emerging walled town and the second largest settlement in Kaldor. Ruled by the powerful Earl of Balim, who may have designs on the throne, it is an important mercantile settlement. Includes a colour map and interior plans. ANISHA: An earthmaster site guarded by the Mendar tribesmen. Numerous legends speak of the enigmatic structures at Anisha and their purported secrets. A map of the site and extensiue inferior plans are included. ELKALL-ANUZ: The ruined capital of Lothrim the Foulspawner's lost empire. For those who can brave the miasma of fear and legend, Elkall-Anuz has many opportunities. TROBRIDGE INN: A waystation on the Salt Route, claimed by both Kaldor and the Thardic Republic and the haunt of cutthroats and brigands. A colour map and interior plans are included. KATH: The wild hillmen of Kathela, pressured by the expansionist Kingdom of Kaldor. CHELNI: The aggressive tribal horsemen of the Chelna Gap. TULWYN: The tough, sometimes brutal, tribesmen of Athul are a major hazard to travel on the Salt Route. NOTE: Most the above material appeared in Encyclopedia Harnica numbers (2), (3), (4), (5), (6), and (8)." 2 full-page color maps in the center. "CHYBISA: A tiny feudal kingdom in eastern Harn, ruled by Verlid VII. Chybisa maintains a fragile independence from Kaldor and Melderyn, both of whose kings have claims on her crown. 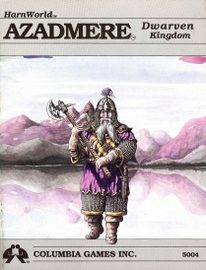 Included is a full-color Atlas Map, plus details on the history, politics, economy, and clans of this surprisingly wealthy kingdom. BURZYN: The largest town and the royal seat of Chybisa. Burzyn is strategically located on the south bank of the Ulmerien, guarding the only bridge to cross this river. 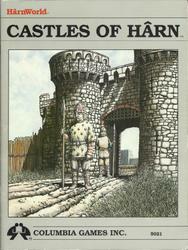 It is a rich trading center, dominated by perhaps the most impressive castle on Harn. HARNIC LAW: A general review of Harnic codes, crimes, and punishments. No civilized society can function without a legal system, and even on Harn, the administration of justice is surprising complex. Included are details on clan and feudal law, royal justice, forest law, trials and enforcement, plus a list of the most common crimes and the typical punishments they bring." This fragmented and unruly northern kingdom, was a Jorin realm before being conquered by Ivinian vikings. 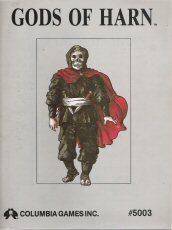 Includes notes on the history and culture of Orbaal, genealogical data on the royal clan, and a colour page of heraldry for thirty-eight great clans. The royal castle and major settlement of the Kingdom of Orbaal, a hybrid community of Ivinian masters and Jarin peasantry. Included is a colour site map and interior plans of the castle. The history and culture of the Jarin, Harn's first human race. They are now a conquered people, but are hostile to their Ivinian masters, and have recently rebelled against them. The only Jarin castle in southern Orbaal, and home of the Primate of Ilvir, one of Harn's unique religions. Includes a colour site map, and interior plans of the motte and bailey castle and Ilviran Temple. The 'Lodge of a Thousand Souls,' a traditional Jarin burial site and the main base of the Jarin resistance to Ivinian rule. Included is a colour site map and interior plans of the Jarin "underground" and a secret Shiran temple. The isolated stronghold and settlement of Noron, one of Harn's most enigmatic inhabitants, who guards the trail between Orbaal and Kaldor. Includes a colour site map and interior plans of the keep. The primitive Jarin tribesmen of Orbaal, inhabiting the forests of the Anoth valley and delta. The nomadic tribesmen south of Orbaal, hostile to most intruders but friendly with the lord of Noron's Keep. The wild hillmen of Himod, a region on the western fringes of Orbaal. Cultural notes and habits of the Harnic harpy, a mysterious winged creature inhabiting the mountains of Horn. All of the above material was formerly published in Encyclopedia Harnica numbers (13), (14), and (15). No new material has been added." The mercantile heir to the fallen Coroni Empire. Includes a detailed full colour mop of the entire region with extensive economic and social information. Also included are historical, cultural, and political notes, plus a full colour plate of the heraldry of the Thardic Legions. A legionary fortress in the heart of a hostile wilderness, Taztos grants a tenuous existence to its garrison. Includes a colour site map and interior plans. The capital of Coranan province, and commanding the Shiran-Coranan road, Telen is one of the most important settlements in Tharda. A colour site map and interior plans are included. A mighty castle on the edge of the wilderness, Moleryn is the last place of safety for many travellers before they brave the perils of the Salt Route. A colour site map and interior plans are included. Details on the unruly seasonal mining town in the shadow of the bandit infested Hefiosa Hills. Also includes information on Sirion, the Miners Guild, and Iracu mine. throughout Rethem and the Thardic Republic. The wild tribesmen of the Mimea Hills and the island of Domid." 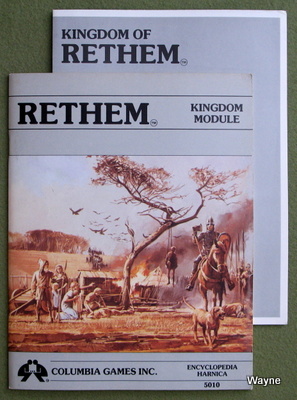 Book comes with a gorgeous 17" x 22" loose, folding map of Rethem. A feudal kingdom with a violent, unstable history, and a tradition of political intrigue, civil war, and assassination. This article includes a detailed full colour atlas map of the entire kingdom, with economic and political data on more than four hundred manors. Also included are political, historical, cultural, and geneological notes, plus a full colour plate of the heraldry of the great clans of the kingdom. The royal seat, and the second largest settlement in Re-them. The castle is still under construction and the king intends to make it one of the most impressive fortifications in western Ham. Included are a colour site map of the town, and interior plans of Shostim Castle. The seat of the Earl of Tormau in northwest Rethem. A ruthless man of high political ambition, the earl seems destined to prolong Rethem's violent history of civil war and political unrest. A colour site map, and interior plans of Tormau Castle are included. One of the most violent and savage tribal nations, related to both the Kubora and Urdu. They are constantly at war among themselves and with their neighbours. The warrior tribesmen of Peran. Ninety years ago a Kuboran chieftain conquered Rethem, something the tribe has never forgotten. The least warlike of the three northwest tribal nations, the Urdu occupy a territory between the Kubora and Equani. They have suffered much in their past, but remain an important independent culture. The ruined stronghold of the old Corani Empire. Kustan is now the tribal moot and religious heart of Kuboran culture. A description of Ham's 'Thieves' Guild', its history, activities, organization, and slang." KETHIRA: A full colour map of Kethira, the name given to Harn's planet. This article includes astronomical notes, plus maps of ocean currents, prevailing winds, etc. LYTHIA: The island of Harn lies off the northwest coast of Lythia. This article is an overview of this continent. It contains a large full-colour map of the entire continent showing the major rivers, mountain ranges, cities, regions, kingdoms, trade routes, etc. Also included is an index describing all of the above, plus political, cultural, and economic maps." KANDAY: A feudal kingdom in western Harn with dangerous neighbours to the north. This article includes a detailed full colour atlas map of the entire kingdom with economic and feudal data on almost flue hundred manors. 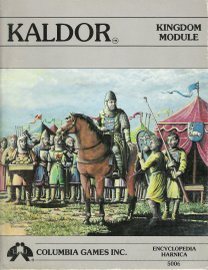 Also included are historical, cultural, and genealogical notes, plus a full colour page on the heraldry of Kandian great clans. MENEKOD: A mighty fortress on the Kanday/Rethem frontier, Menekod is held by the Laranian fighting order of the Checkered Shield. Besides the ongoing border skirmishing with Rethem, there is a haunted wood nearby, and a mysterious grotto beneath the castle, includes a colour site map and interior plans. DYRISA: The principal seat of the King of Kanday and the second largest town in the kingdom. There are dozens of ancient barrow graves in the area, and two famous royal ghosts make their home in the vicinity. A colour site map and interior plans are included. TESIEN: Better known as "Place of Bones", Tesien is an Earthmaster site in Ternu Heath. The headquarters of an efficient gang of brigands, Tesien has several dangers for casual adventurers. Includes a colour site map, several interior plans, and scenario notes. ADAENUM: The tribal nation inhabiting the island of Anfla, and the object of expansionist desires by some Kandian nobles. Their witch hunting cults are something of a menace to visitors. KAMAKI: The peaceful tribesmen of the island of Kamace have a unique racial origin and are the subject of numerous Harnic legends." MELDERYN: The enigmatic "wizards' kingdom" of Harn has always had a pervasive influence over the region's culture: This article includes two detailed full color atlas maps of the kingdom, with economic and political data on over eight hundred manors. Also included are political, historical, cultural and genealogical notes, plus a full color plate of heraldry of the great clans of the kingdom. NURISEL: The seat of the immensely powerful Earl of Nurisel, a dabbler in magic and a member of the Council of Eleven. Included are a color site map of the settlement and detailed interior plans of the castle and other local buildings. HARDEN: The seat of the Earl of Ehrin and the capital of the old kingdom of Elorinar. Harden has been in slow economic decline since the foundation of the nearby city of Thay. Includes a color site map of the settlement and detailed interior plans. GELIMO: A relic of the forgotten Henge Culture that once dominated the island, Gelimo is now home to a community of mages. Includes a color site map and interior plans of the Fyvrian chantry. ARCANE LORE: The Guild of Arcane Lore is a loose association of mages, alchemists and wielders of esoteric power. This article deals with the organization of the Guild, with information on entrance and instruction. 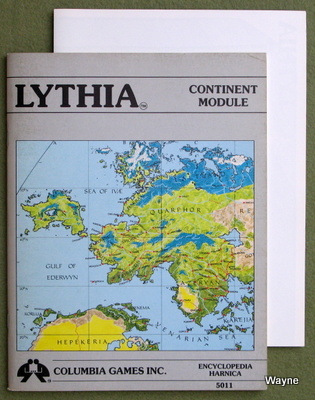 Also includes a list of most major chantries in Lythia. EARTHMASTERS: These ancient beings left mysterious and powerful ruins scattered throughout Harn and Lythia. This article deals with some of the most popular hypotheses regarding them and reveals the "truth" about their origin. SOLORI: A beleaguered tribal people, harassed by "crusading" Laranians and the horse clans of the Hodiri. HODIRI: The fiercely independent horsemen of Horadir have defied every attempt to tame them. CHYMAK: The peaceful fishermen of Belna Island are in high demand as sailors on civilized vessels." "The mysterious "pit of Ilvir" is reputed to be the home of Harn's most bizarre inhabitant, the deity Ilvir. The fetid pool is said to be the breeding ground of the Ivashu, the god's strange creatures, and it is the final destination for many Ilviran pilgrims. This article includes two colour maps, one of the pit itself and the other of a nearby Ilviran temple complex. Interior plans of the temple, and extensive maps of the caverns beneath Araka-Kalai are also included. Details on the geography and history of the area are dealt with, and information on the Ivashu and the enigmatic Dark Order is also given." 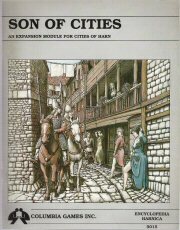 "This module includes floor plans of various buildings in the seven Harnic cities. 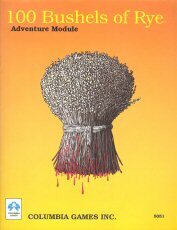 While owning Cities of Harn is helpful, the floor plans in this module can be plugged into any fantasy town. ALEATH: Floor plans of the Palace of Aeldele, the town hall and royal mint of Kanday. Also includes the Guild of Arcane Lore, the beleaguered Aleathian Thieves' Guild, and a selection of businesses. CHERAFIR: Plans of the Alienage, Cherafir's "Foreigners' Quarter". Also includes the Enclave of the Golden Orb, the primary Harnic college of Heralds. CORANAN: Plans of the Palace of Pentacles, one of the most powerful chapters of the Mangai on Harn. The plans of the House of Usel, one of Harn's better known gladiatorial schools are also provided. GOLOTHA: Plans of the temple of Morgath, perhaps the most evil place on Harn. Also includes plans of the dangerous "floating town" beneath Northaven Wharf. SHIRAN: Two of the "City of Sins" better known attractions are shown; the primary Harnic temple of Halea, and the Crimson Palace, Harn's most famous house of courtesans. TASHAL: Plans of the temple of Peoni, and a selection of four Tashalan inns. THAY: Plans of the Laranian temple, and seat of the Harnic primate of that church. Also includes plans of the ruined temple of Peoni." "Kiraz, the golden city, birthing bed of the Harnic Khuzdul. For seven thousand years Kiraz was the largest and richest city of Harn. The dwarves made her well, and she endured the coming of men, their haste and pestilence, their greed and wars, yntil, that is, the tyranny of Lothrim, the Foulspawner. Now gloom hangs like a shroud about Kiraz, sealed with enchantment and good stone. Her dark and cavernous, haunted halls, seem yet to ring with the muted sounds of hammers no hand has touched for six centuries. Even the woods echo with the voices of a hundred ghosts. The hills surrounding Kiraz are home to numerous bands of ores. There is a major gargun colony at Ushet, a rave-complex just four leagues southeast of the Kiraz, Ushet is inhabited by a hybrid culture of Gargu-Khanu, and their Gargu-Arak and Gargu-Hyeka slaves. The Khanu, also known as black ores, are the largest, strongest, and most murderous of the five gargun species. 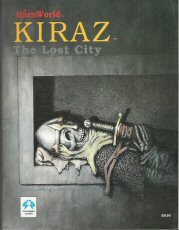 Kiraz is also the scene of the second quest m the epic search for the mysterious, otherworld, arch-mage, Panaga. In the first quest, The Staff of Fanort, players were introduced to Panaga's misdeeds; in this quest they will come to realize that he is their nemesis. Compatible for all rule systems." All eight sites in Castles of Hârn include a color local map, interior plans of each castle, and a key to special features in each settlement. GEDA: The seat of Baron Kjal Forsetha in the tiny kingdom of Chybisa. Geda is a thriving small town on the Genin Trail. GESHTEI: Capital of Gerium Province in the republic of Tharda. Geshtei is a center of intrigue between two powerful Thardic families. GYTHRUN: A growing port on Melderyn's mainland coast, and seat of the Earl of Biren. He is a staunch opponent of the bloody Laranian crusade against the Solori. ITHIKO: Birthplace of the Balshan Jihad that changed the character of western Hârn. It is now the seat of the Earl of Ithiko, but the influence of the Morgathian church remains strong. LORKIN: The stronghold of Clan Geldastaar in Orbaal, inhabited by the Spectre of Lorkin. QUALDRIS: The seat of the Earl of Osel in Kaldor, and home of the Bloody Tapestry. QUIMEN: A keep held by the intolerant female Order of the Crimson Dancer. Their savage brutality started the Jarin Rebellion of 701. SARKUM: Seat of the powerful Earl of Sarkum in Kanday, father-in-law of the king." A full color map of the Kingdom of Orbaal, showing all major settlements, roads, trails, etc. 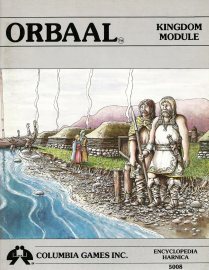 An index of political, social, and economic data for each settlement, and a revision of the Orbaal kingdom article are included. The seat of Tursi Cyeen, located on a small island off the northwest coast of Orbaal. It is a center of the rich fur trade. A motte-and-bailey castle in northern Orbaal. Clan Serewyn has maintained a vicious, thirty-six year bloodfeud with the ruling clan of Sherwyn. The seat of Knurri Storzand, a stubborn and brutal lord who controls the mighty Vaagesfjord in northern Orbaal. The impressive island stronghold of Clan Sherwyn, located on the Balakas Islands off the northeast coast of Orbaal. Note: all four castles include a full color local map, detailed interior plans, and a key to special features in each settlement. 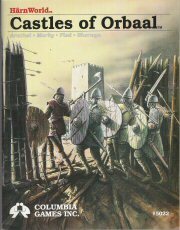 Four additional Orbaalese castles are detailed in two other publications: Lorkin and Quimen in Castles of Harn; Geldeheim and Leriel in Orbaal." A stormy day in early winter. Gusts of wind whip up the powdery snow cloaking Ternu Heath in a mantle of white. A lone group of travelers hurries to a remote Laranian abbey to escape the merciless weather. The powers of fate have chosen them to become involved with a series of violent murders at the abbey. Chendy is an abbey of the Laranian Order of Hyvrik, held from the Bishop of Ternula. Someone is killing clerics of the abbey. But why isn't there a corpse to be found after each murder? Are there in fact really any murders, or is someone playing a devious game? Why are the other noble guests of the abbey so chilly and remote? Has the time of the final battle between Larani, the shining guardian of Dolithor, and Agrik, the Lord of the Four Horsemen finally come, fulfilling an ancient dark prophecy? In an atmosphere of fear, mistrust, political intrigue, and religious hysteria, the characters must discover the answers to these questions if they hope to survive. 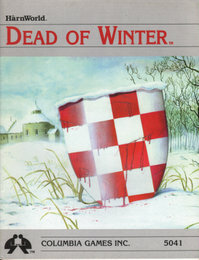 Dead of Winter contains detailed descriptions of a Laranian abbey and village situated on the southern edge of the Ternu Heath in Kanday. 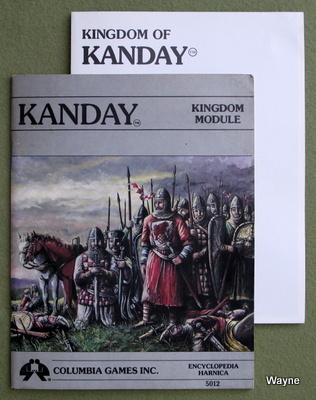 The complicated political situation in Kanday and the kingdom's difficult relations with its neighbors impact the plot. Gamemasters will find this module a valuable aid when designing further adventures in western Hârn. "100 Bushels of Rye is an adventure module for Hârnmaster, but it is sufficiently generic to be adapted to most other rule systems. The adventure is set in Kaldor, a feudal kingdom in eastern Hârn. It's a gloomy, overcast, autumn day in Olokand. Sir Maldan Harabor, Sheriff of Meselynshire, has been informed by the local chapter of the Miners' Guild that the Amba Mine in the west of his shire has been closed due to a mysterious outbreak of violence. Several murders have occurred, and to make matters worse, unconfirmed rumors indicate the crimes have spread to the nearby village of Loban itself. A written request for information from Sir Kathel Dezaller, lord of Loban manor, has been ignored. Sir Maldan is anxious to see that the mine is re-opened before his own lord, the King of Kaldor, starts asking some embarrassing questions. He is also worried that Loban's annual feudal obligation, namely 100 bushels of rye, has not yet been received. Harvest time has passed, and this debt has always been delivered by this time in past years. He would be a lot more worried if he knew the truth. The players must investigate the violence at Loban manor and Amba mine, and then if possible solve the mystery. The village of Loban has been mapped and described in some detail. 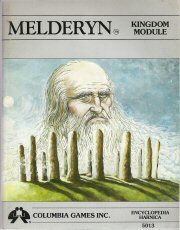 The module will give your players a better understanding of rural life on Hârn, in addition to a scare or two." BORIN: An Ivinian thran and port in northern Harbaal. The settlement lies at the western end of the Bovoni Trail, one of the few passes through the high Harbalese Alps. HLEN: An outpost of the Kingdom of Jarenmark in northern Hurisea, held by clan Pelstrorn. Once a burial ground of Jarin chieftains, an evil curse involving tales of "walking dead" has overtaken this once prosperous Ivinian community. VARAXIS: A tortured maze, created by the Gods as a trial by ordeal to settle disputes of the Concordat of the Illimitable Tome. The location of Varaxis is unknown to any mortal, although most believe it to be somewhere between worlds. CITY OF NASCENT VISIONS: A great city in Yashain, fought over by legions of Larani and Agrik for thirty centuries. The city is currently held by Hrak'arak-Dielvin, an ambitious warlord of unknown origin. And Panaga awaits..."
The Gargun (also called orcs and Foulspawn) reside in the high mountainous areas of Harn, where they squabble, mairn, kill, and cannibalize each other, or any other species they encounter. 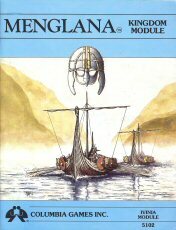 This book provides details on Gargun culture, maps of four orc colonies, and six related adventure scenarios. BWAFT: A natural cave complex situated high in rugged mountains. After centuries of relative peace, the Gargun of Bwaft find themselves involved in a vicious war with the nearby Gargun of Huxuth. "A Walk Among Tombstones" involves the players in this war, while "Dead of Night" provides them the chance to enrich themselves at the expense of Bwaft's inhabitants. EJATUS: A cave complex with an Araki (small orc) population ruled by a Khanu (great orc) elite. These Khanu are highly-organized and dangerous, as anyone involved in the. "Dance at the Slaughterhouse" scenario will soon discover. FANA: A rich silver mine seized by Gargun six centuries ago, and still held by them despite dozens of attempts at recapture by the dwarves of Azadmere. The orcs of Fana traditionally skirmish with nearby orc colonies, and are always a menace to travelers. "The Last Worst Hope" deals with another dwarven attempt to retake Fana. KOREGO: The oldest and largest Gargun colony on Harn. The orcs of Korego have a long history of conflict with both the local human tribesmen and merchant caravans. "We Deal in Steel" is a mystery involving arms-running. "To Live and Die in Korego" gives the players a rescue mission in which some things are not what they appear." 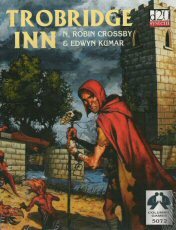 "Trobridge Inn is an exciting adventure module that brings players to a frontier 'outpost and involves them in intrigue and terror. Diplomacy and strength are essential skills for survival. The site is a fortified inn and key layover for caravans on the main trail between eastern and western Harn. The inn lies on the western edge of Chelmarch, a vast territory claimed by the Kingdom of Kaldor, but controlled by the warlike Chelni barbarians, The Thardic Senate also covets Trobridge. Trobridge is controlled by two rival factions. Terlin Wesindan holds the inn and employs mercenaries to oppose Kurson Ondailis, a warlord who exacts tribute from locals and caravans. Into this volatile situation arrive two official embassies, a herald from Kaldor and a seductive priestess from Tharda. They have come to see if Kurson Ondailis is strong enough to control Trobridge. Complicating matters, a mad priest appears with summoned Vlasta, and warring barbarian tribes may destroy Trobridge. Pre-Generated Characters: Trobridge includes fifteen (15) pre-generated characters with HarnMaster and d20 stats." "IVINIA is part of a. continuing series of fantasy role-playing aids. 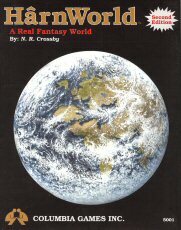 Considerable effort has gone into creating this detailed, logical, and consistent fantasy world; an authentic "Viking" environment, of unsurpassed quality, specifically designed for fantasy gaining. IVINIA is compatible with any rule system you may now use. You can now create and plan your campaigns, quests, and inking adventures within a complex and realistic background, confident that this world will unfold as it should. IVINIA is a time-saving machine! Veteran game-masters know how much time and effort is needed to develop a detailed and consistent campaign world. Everyone who desires the best possible "Norse" environment for fantasy role playing, needs IVINIA. IVINIA gives vast scope to your creativity; it is not a programmed adventure module, leadingy ou by the nose. Your creative efforts will be supported by a carefully crafted series of expansion modules, each providing additional consistent material. REGIONAL MAP A beautiful color map (22"x 34") of Ivinia, covering an area approximately 600 x 900 miles. This is a useful and detailed technical map, with a 1 cm (3/8") hex grid, and a location grid for easy reference. OVERVIEW A 32 page booklet describing fvinia, and gamemaster information, including: birthing characters, pregame bints, weather generation, encounter tables, and much more. 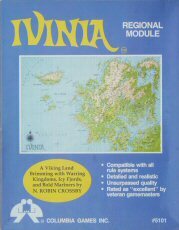 INDEX A 48 page booklet describing almost 600 entries on the geography, religions, cultures, politics, and economics of Ivinia, including: mountains, rivers, towns, castles, kingdoms, dwarves, dragons, gods, temples, prices, incomes, etc. The index also contains numerous illustrations all compiled into one alphabetical reference, making information access quick and easy." There are 6 full-page color maps, each with a black & white player's map on the reverse side. Plus a 11"x17" map of Menglana. MENGLANA: A once great kingdom now in decline and under pressure from both the rising power of Ibanuaal and the piratical realm of Rogna. The aging king stubbornly clings to power and there is growing civil unrest among the clans. 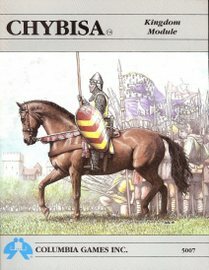 Includes a full color atlas map of the kingdom's heartland, and a color plate of heraldry of the Mengianan great clans. VULENHEIM: The only walled town in Menglana is a major trading center and a power base of warring royal factions. Merchants travel from here to the furthest reaches of western Lythia. Includes a full color map of the settlement and interior plans. PELYN: The royal stronghold of the Stahlers, rulers of Menglana. Pelyn is a dangerous place for lukewarm supporters of the throne. Includes a full color site map and interior plans for the great hall of the king. FROYAHEIM: A heavily garrisoned stronghold near the Ibanvaal border held by the Storzars, arch-rivals of the royal clan. An attack from Ibanvaal is expected in the coming year. Includes a full color map of the settlement and interior plans. LOKIS: A tiny independent kingdom on the west coast of Ivinia. most famous as the home of the Oracle of Lokis. Lokis has great religious significance to pious Sarajinians. KYRIHEIM: A site sacred to the Elkyri, the "wives of Sarajin", and the home of the Oracle of Lokis, Ivinia's most reliable prophet, includes details on the cult of the Elkyri and a color map of the site. ROGNA: Less a kingdom than a murderous band of pirates, the Rognans are planning an invasion of Hutheng. The ruling clan is closely associated with the church of Agrik. YARILI: The first human inhabitants of Ivinia are related to the Jarin of Horn. A nomadic people, they subsist by trapping and trading." 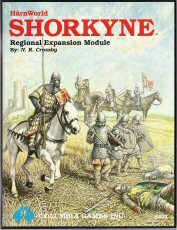 "SHORKYNE: A large feudal kingdom in the south of the region. Shorkyne has been a powerful lure to great empires, but has maintained her independence by military excellence. The kingdom always seems to be on the verge of falling apart, for it's a land where scheming, regional lords (several dukes of Shorkyne are far more powerful than Harnic kings) hold sway over a weak throne. But somehow, when the need arises, they have united to defeat invaders. CHELEMBY: A small island kingdom at the gateway to the Gulf of Shorkyne. Founded by Ivinian warlords, Chelemby is now a powerful, trading city-state. HARBAAL: An unruly confederation of twelve petty kingdoms paying tribute to Pendragon Trails Elendy. Harbaal is the most powerful of all Ivinian kingdoms. Many believe her destiny is to rule the entire region. HURISEA: A region of petty fiefdoms, held by independent, ruthless barons. Sitting astride the mighty Tirga river, Hurisea has always been a lure for powerful men. Hurisea has been described as islands of chaos amid a sea of anarchy."